bragging rights are at stake!! 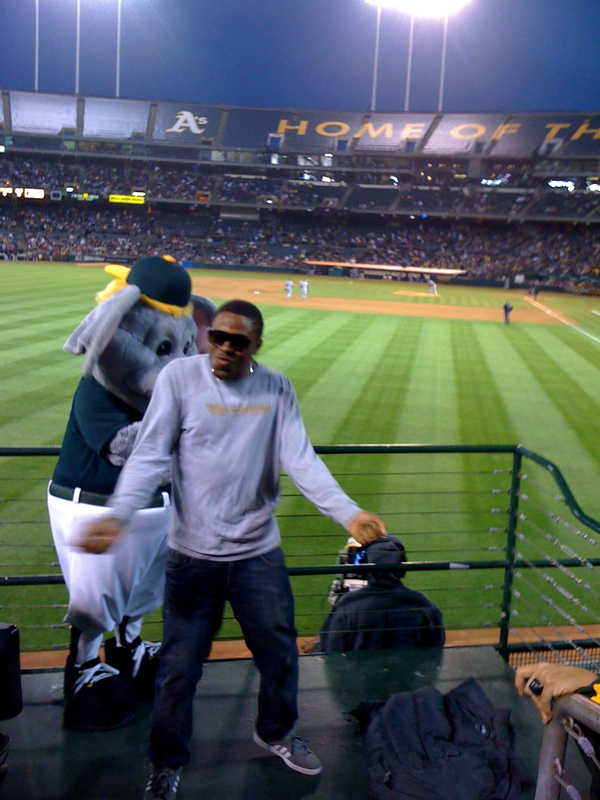 The dance-off is, without a doubt, one of my favorite contests to host — and watch — in the Coliseum. 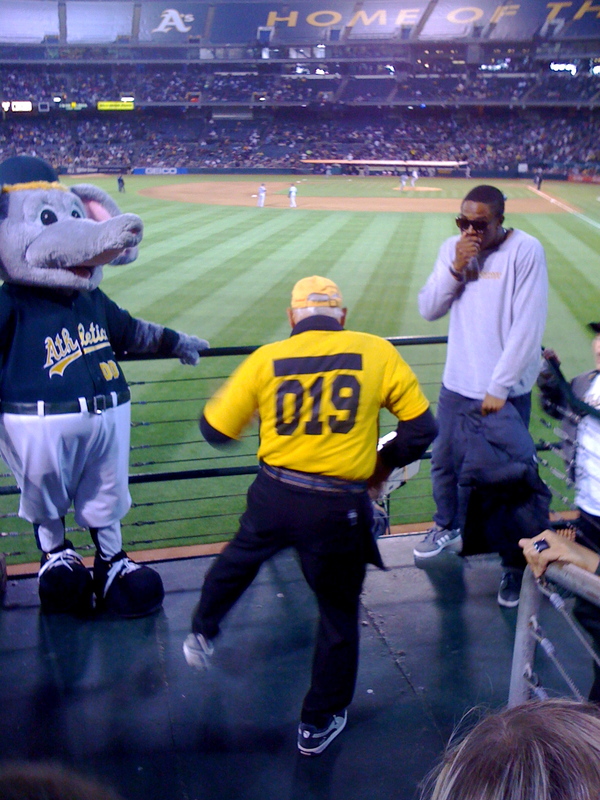 But really, who doesn’t love a dance-off?! It’s a win-win situation for the spectators: if the fan is horrible (which more often seems the case), it’s at least amusing, but if someone has sweet moves, it’s hard to take your eyes away. 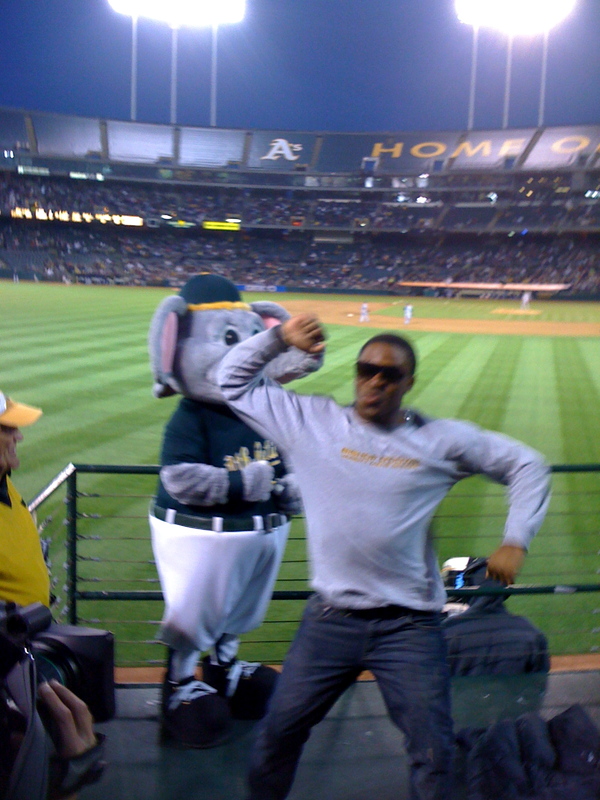 From an entertainment and skill level standpoint, the last Coliseum dance-off sure is going to be hard to beat. 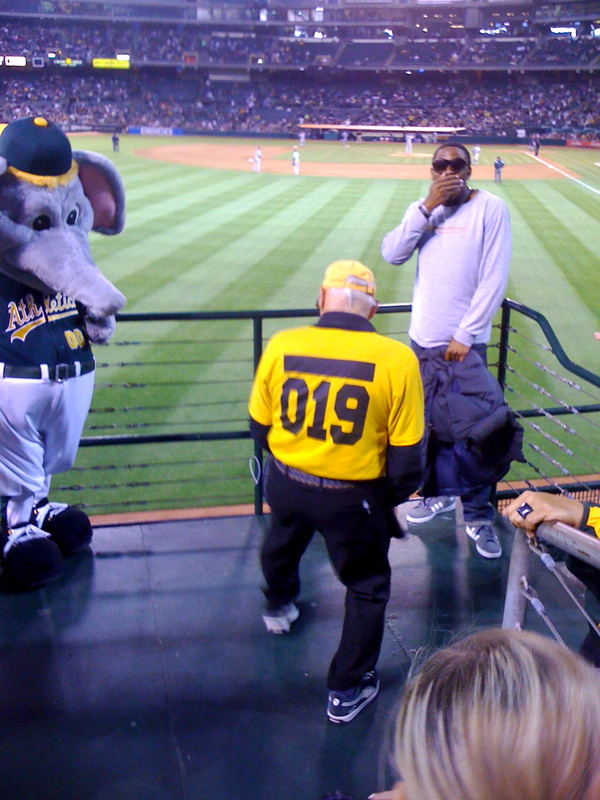 We put a hot, young kid up against Howard the “Crazylegs,” a stadium kettlecorn vendor (you know who I’m talking about — the older gentleman who shakes his hips and swings his legs any chance he gets). 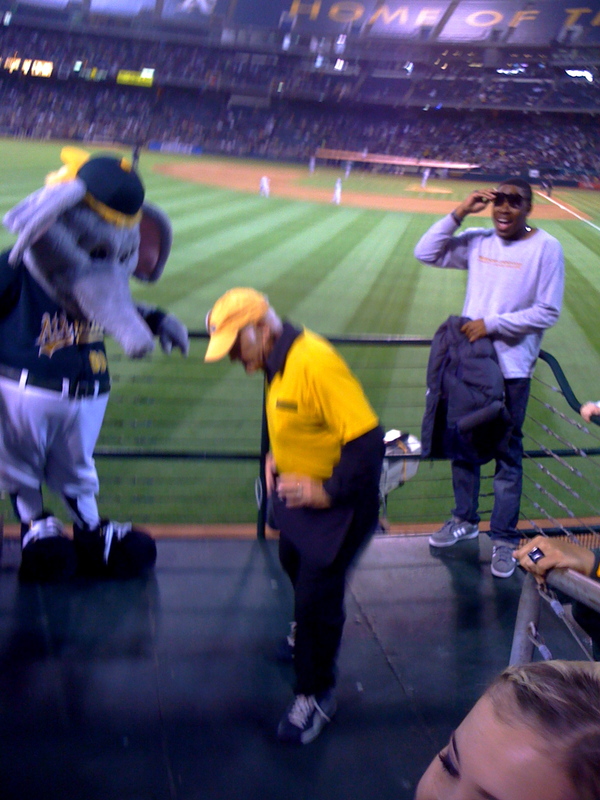 The kid danced first, and wow, did this guy have some slick moves! He would have won handily in any other circumstance. Crazylegs was up next…and absolutely killed it. The crowd went wild! I just love the kid’s expression on his face as his watches Crazylegs dance. I don’t know what he was expecting, but certainly not that! Also, a big thank you to Matt from Stomper’s Herd for taking these great photos. If you think you’ve got what it takes to shake it on stage in front of a crowd of thousands, then send me a message and let’s put your skills to the test. 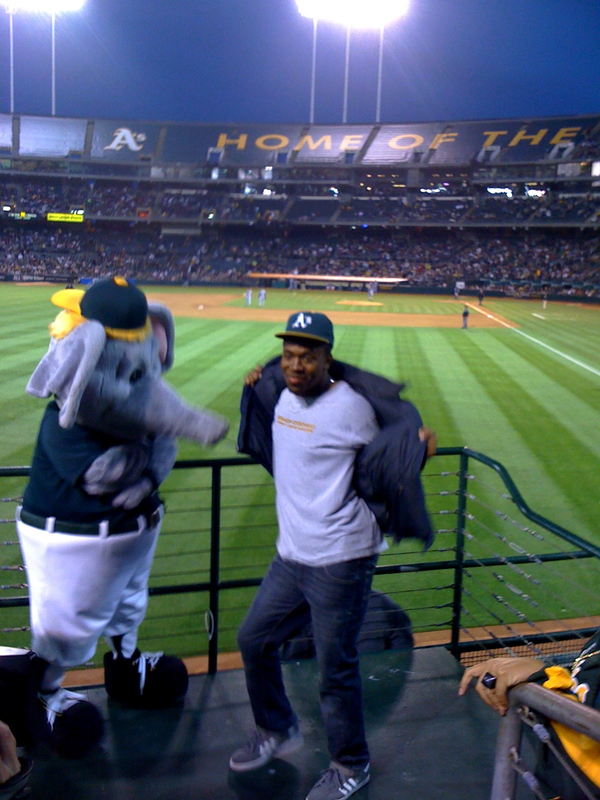 Fans, see you at the game tonight — and as always, Let’s Go Oakland! With a season and a quarter under my in-game hosting belt, I’ve always said the best fans turn out on the ickiest game days. You know, those cold (and sometimes rainy) Monday and Tuesday nights early in the season when the A’s are playing against a struggling opponent. I’d like to personally thank you, the fans, for showing up! 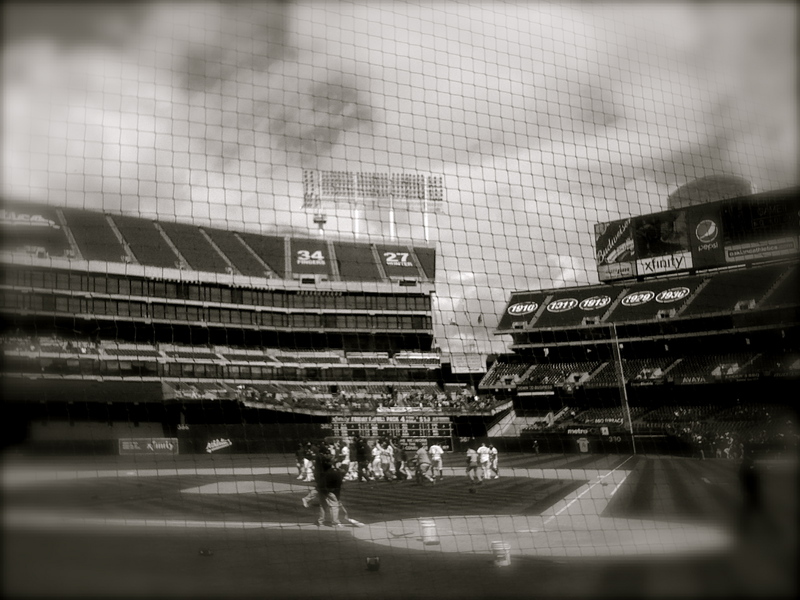 Here are some snaps capturing some of my favorite moments during the games. 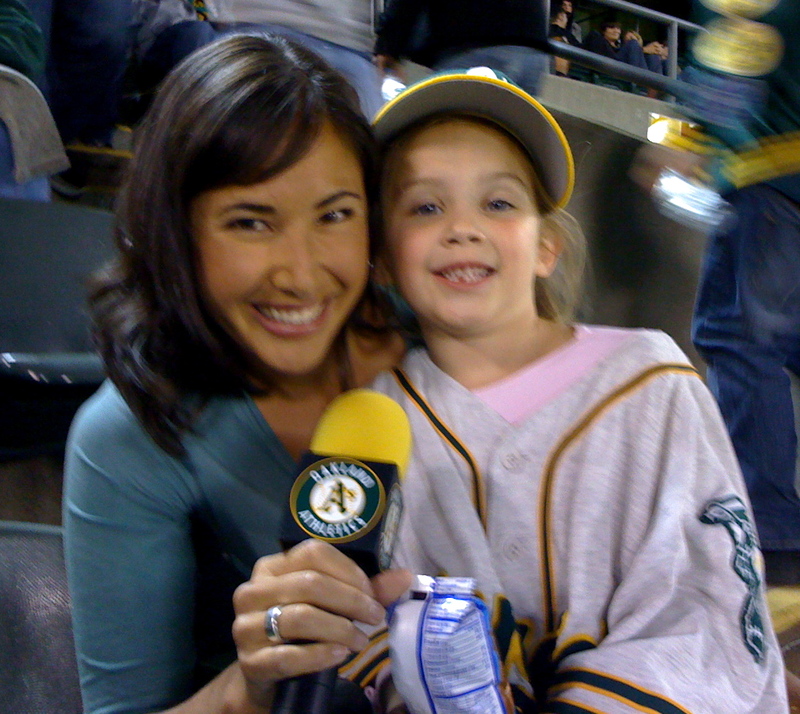 On the left, we have 5-year old Erica who immediately climbed into my lap and wanted to chat about anything and everything. Tuesday night’s game was her first baseball game ever, but I’m hoping she’ll become a fan for life! 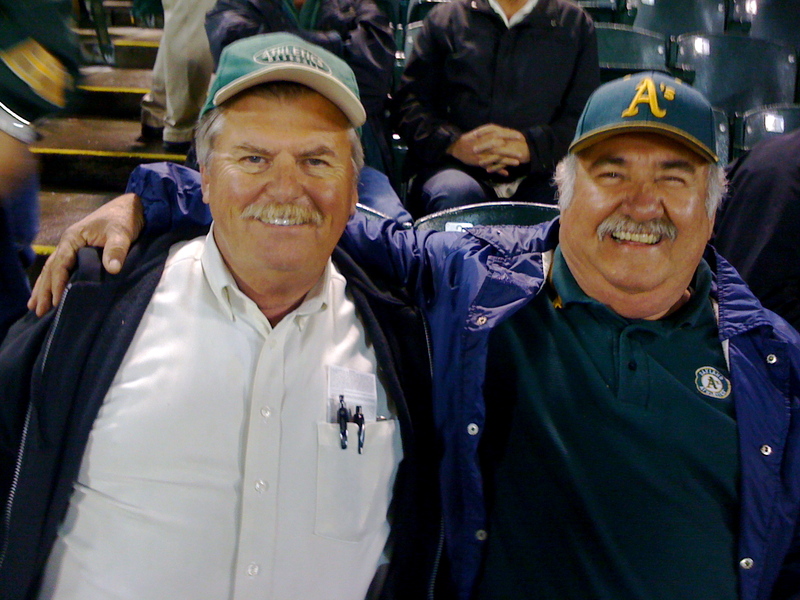 On the right are two buddies from Castro Valley celebrating a 67th birthday. I interviewed Hefren and Max, left, about sending text messages to the big screen. Out of nowhere they came up with the cutest jingle that was met with a huge applause from the crowd: “Extra, extra, read all about it! Seattle’s going to lose, no doubt about it!” Awesome. 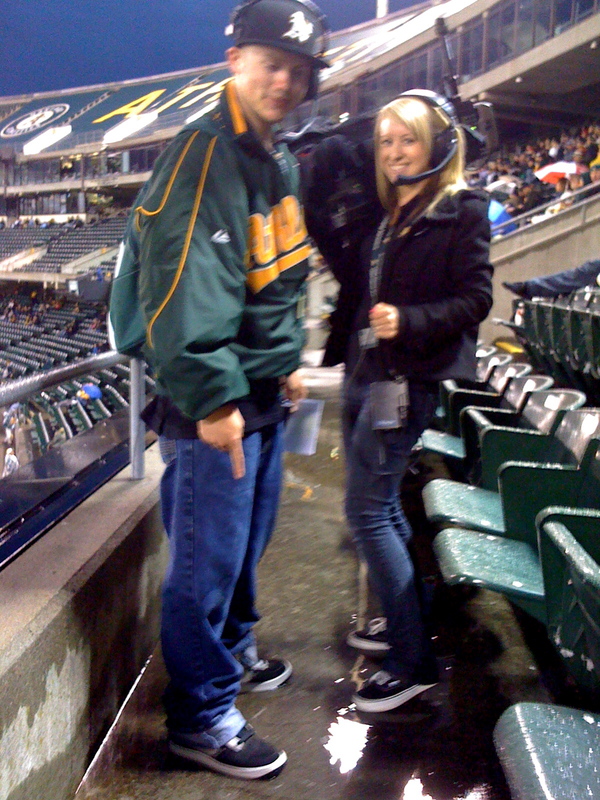 On the right, our hard-working A’s interns, Steve and Jessica, wading through puddles on the second deck. 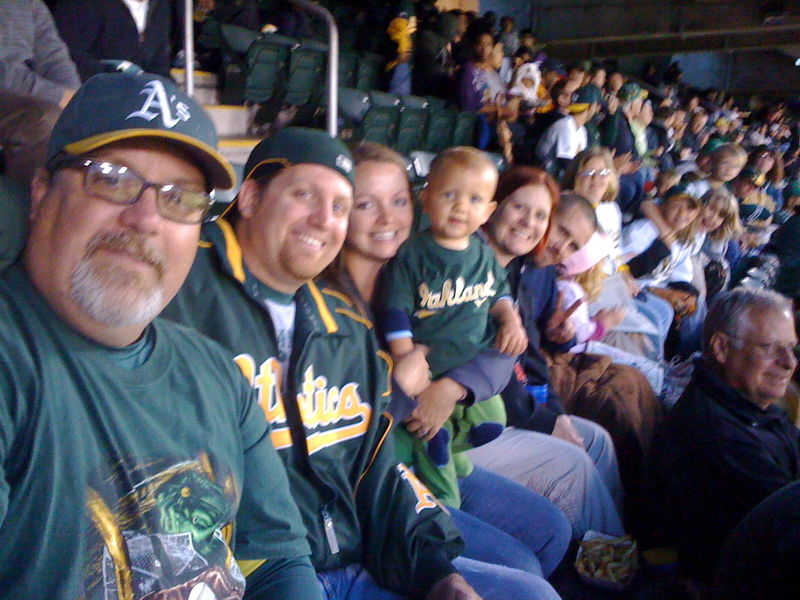 The Garlets family on the left is one dedicated A’s family. 16 of them turned out on Monday’s game to celebrate 7 May birthdays. 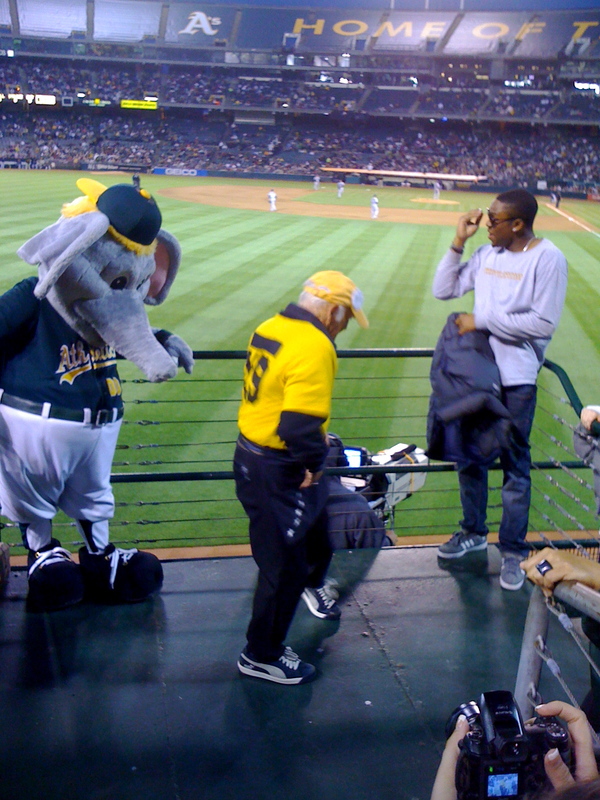 And on the right, Miss Audrey is celebrating her 77th birthday at the ballpark. Alright fans, we could be in for a few more wet, cold nights this week, but please don’t let that keep you home. 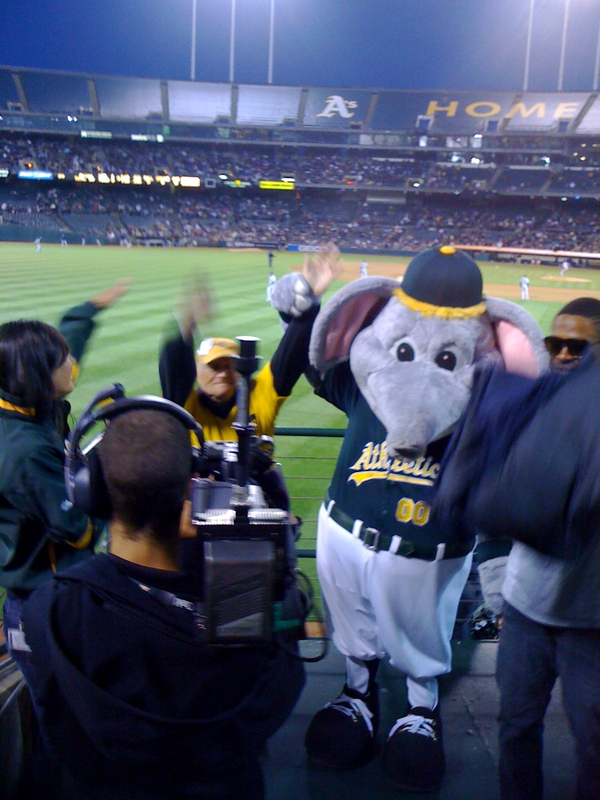 Come on out to the Coliseum tonight as we take on the Detroit Tigers. See you there, fans! TUESDAY: $19 lower box tickets and FREE parking for Game 2 against the Seattle Mariners. The price is 19 because Braden is the 19th pitcher to throw a Perfect Game. Get it?! 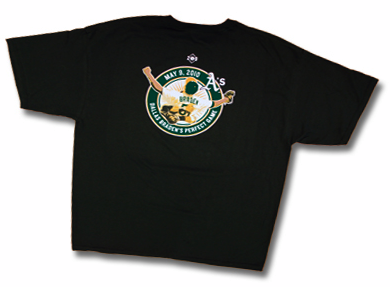 WEDNESDAY: The first 15,000 fans will receive an awesome Braden Perfect Game commemorative t-shirt for Game 1 vs. the Detroit Tigers. Not to mention, it’s Double Play Wednesday with $2 second deck tickets. 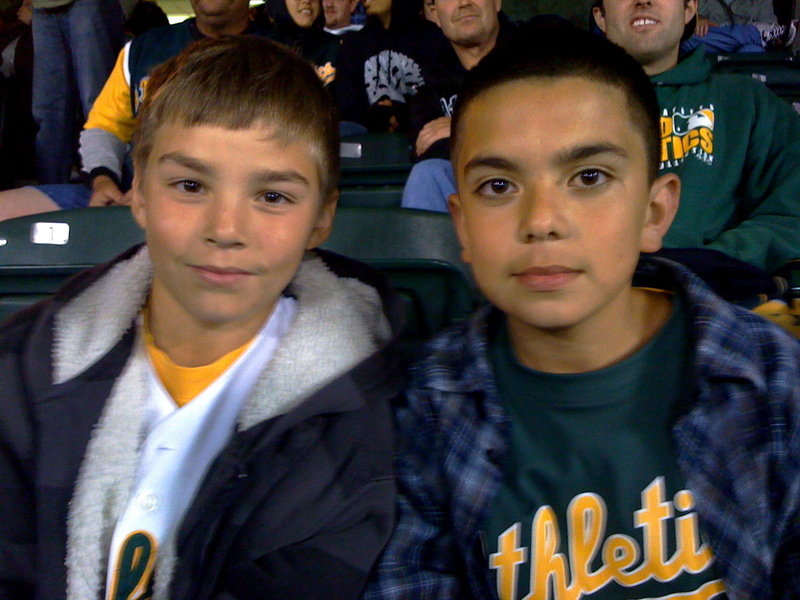 THURSDAY: Not to be missed, the A’s are giving the first 10,000 fans Perfect Game replica tickets with lanyards. A true collectors’ item! FRIDAY: Finally, Braden will get the recognition he deserves at a special pre-game celebration. 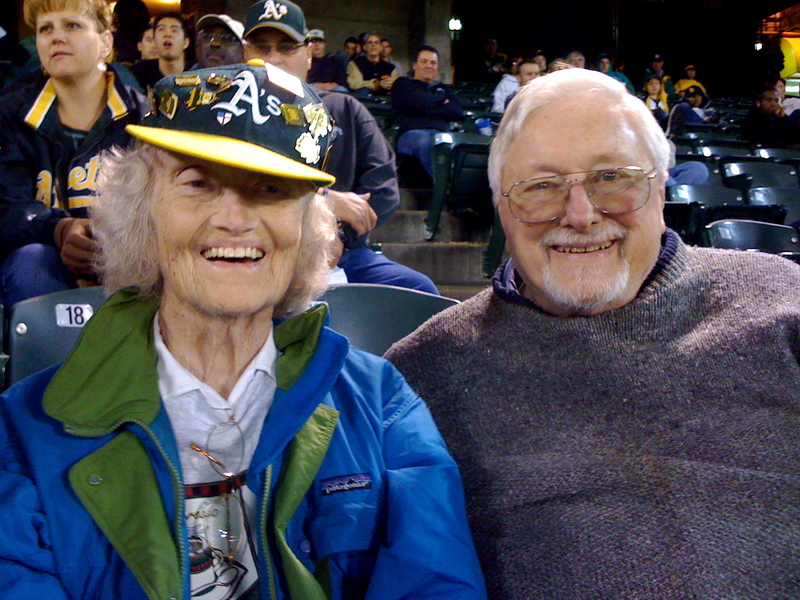 On top of that, his beloved Grandma, Peggy Lindsey, will be throwing out the first pitch. I don’t expect to see a dry eye in the house! 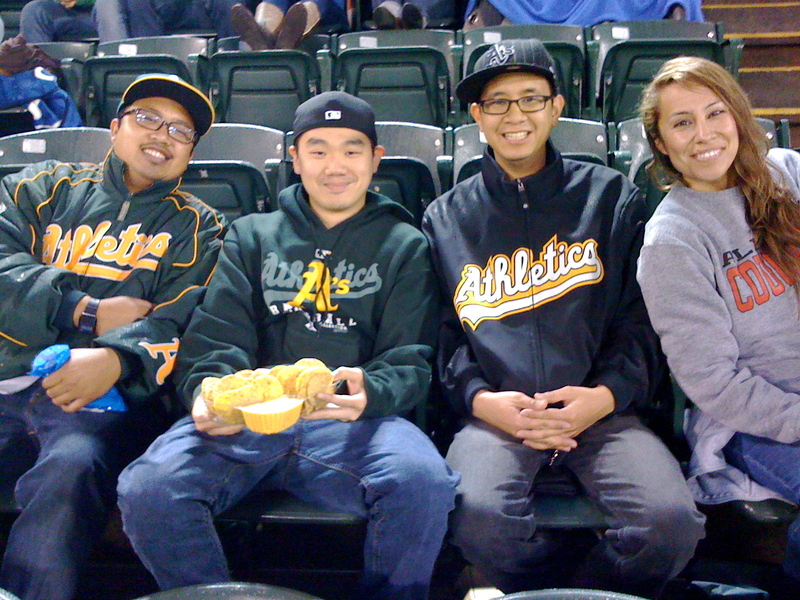 SATURDAY: For Game 2 against our rivals across the Bay, the San Francisco Giants, Field Level tickets will be $5 off. 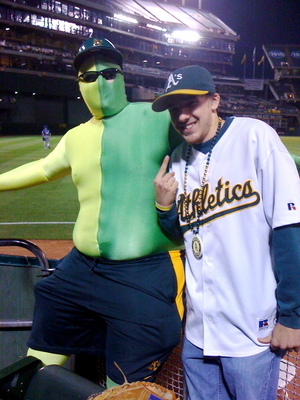 Come on A’s fans, we need your green and gold in the Coliseum to drown out the orange and black! SUNDAY: To wrap up the homestand, the A’s will be giving the first 15,000 fans a Dallas Braden Perfect Game poster. 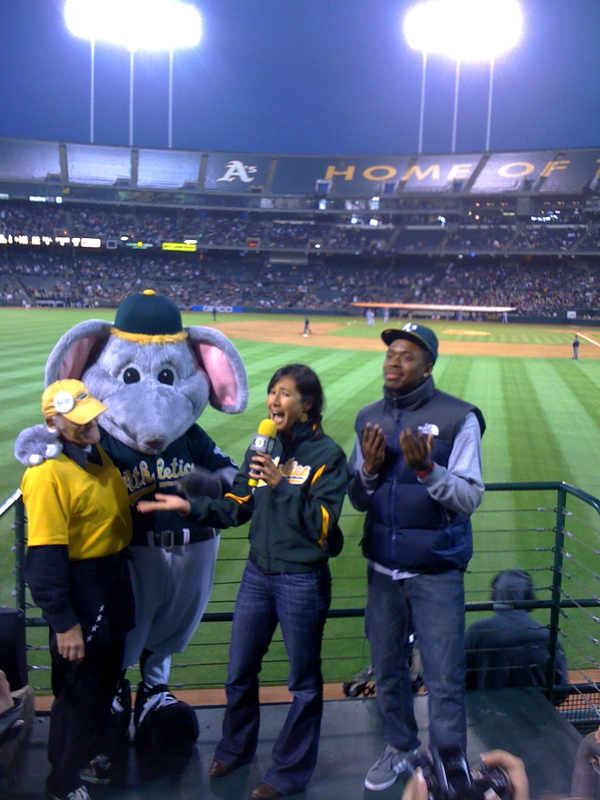 I’m looking forward to seeing you at the Coliseum — i’s going to be a perfect celebration week! For more information on these ticket deals and to purchase them online, click here to check out the A’s website. 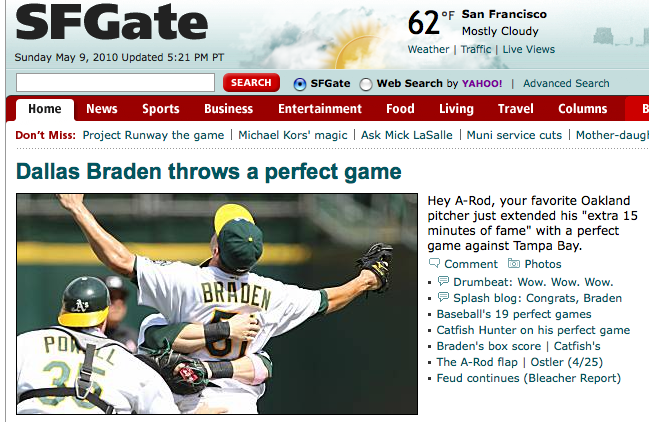 The media frenzy continues over Dallas Braden’s perfectly thrown game on Sunday. And for good reason. After all, he joins an elite club of only 18 other pitchers in the history of baseball to see the game’s minimum of 27 at bats. As you’ve probably noticed, he’s the talk of the sports world and one of the most searched names on the internet this week. 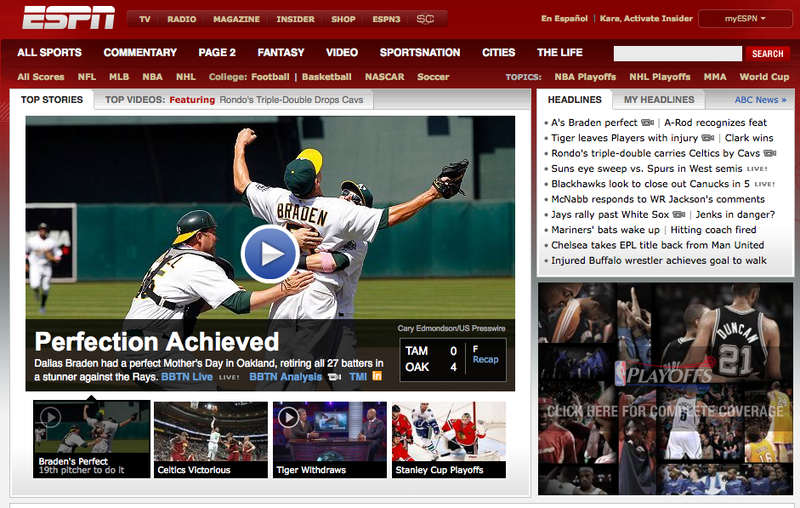 To honor Braden’s accomplishment, he’ll appear on the cover of next month’s Sports Illustrated magazine. 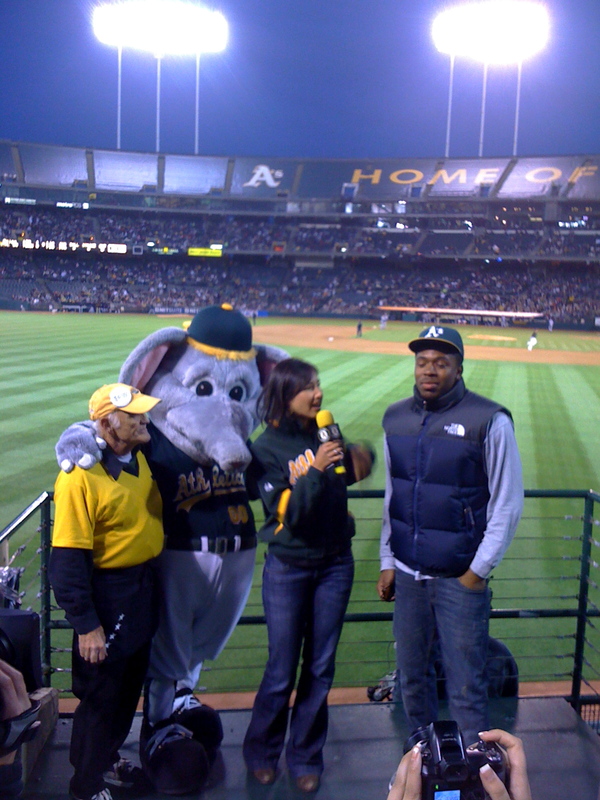 Thanks to Vlae Kershner of SFGate’s “The Drumbeat” blog for posting. 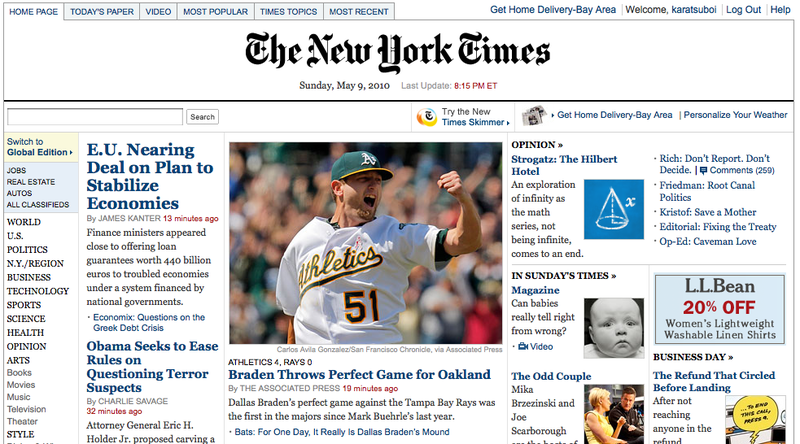 Also, we just learned that Braden will be hosting David Letterman’s Top 10 list on the Late Show tonight. Awesome! What do you think — how many on the list will refer to A-Rod?! 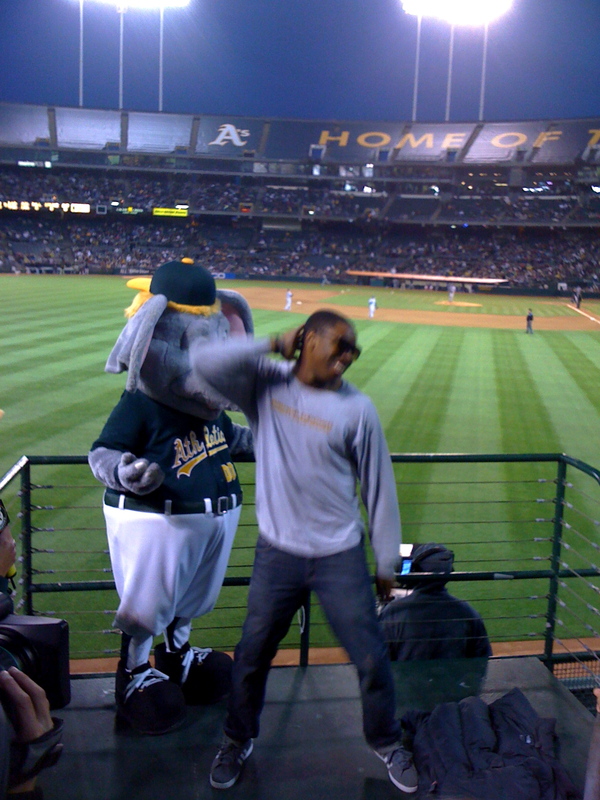 And who knows, perhaps this performance could foreshadow a post-baseball career for Braden. He’s got the wit, poise and charisma to last in the public eye for a long, long time. 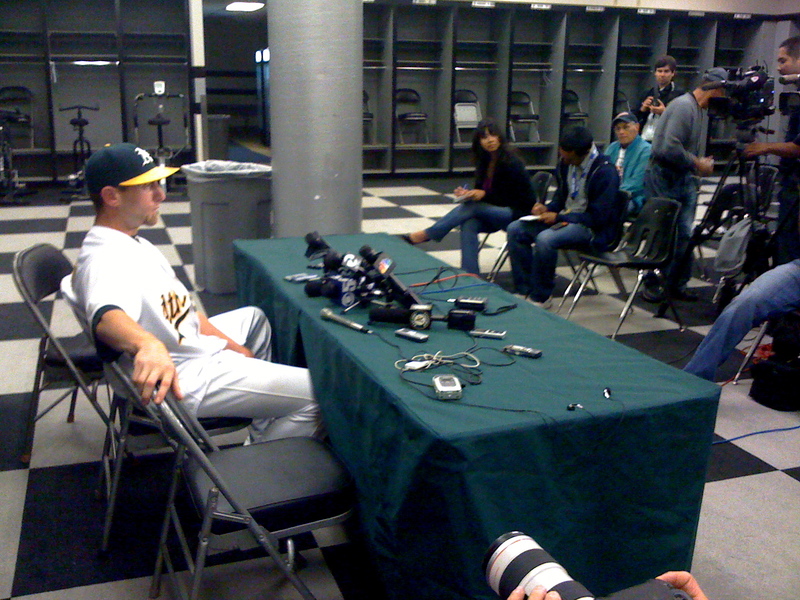 Above and Right: Dallas Braden fields questions from the media at his post-game press conference. 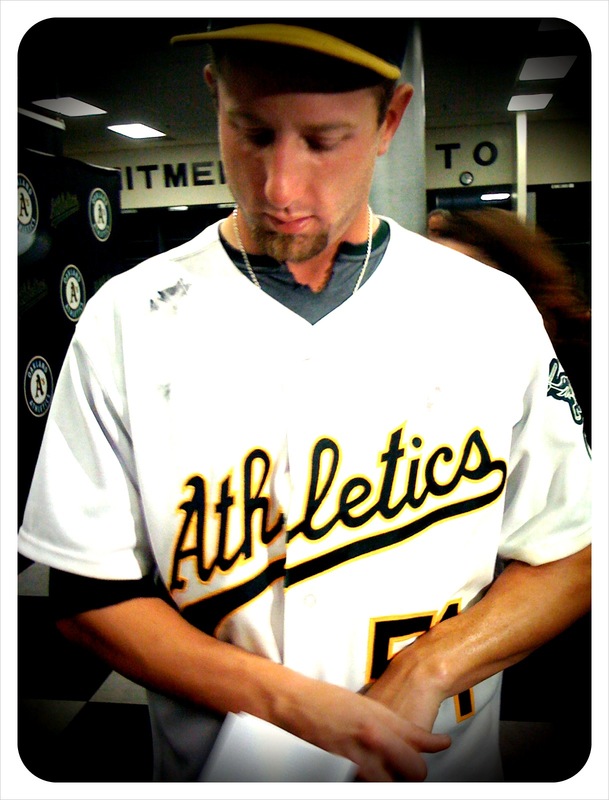 Braden has said that he plans to send his game memorabilia (jersey, hat, glove, etc…) to the Stockton Hall of Fame. If you didn’t know there was one, there is now! Left, me posing with Braden’s grandma, Peggy Lindsey. 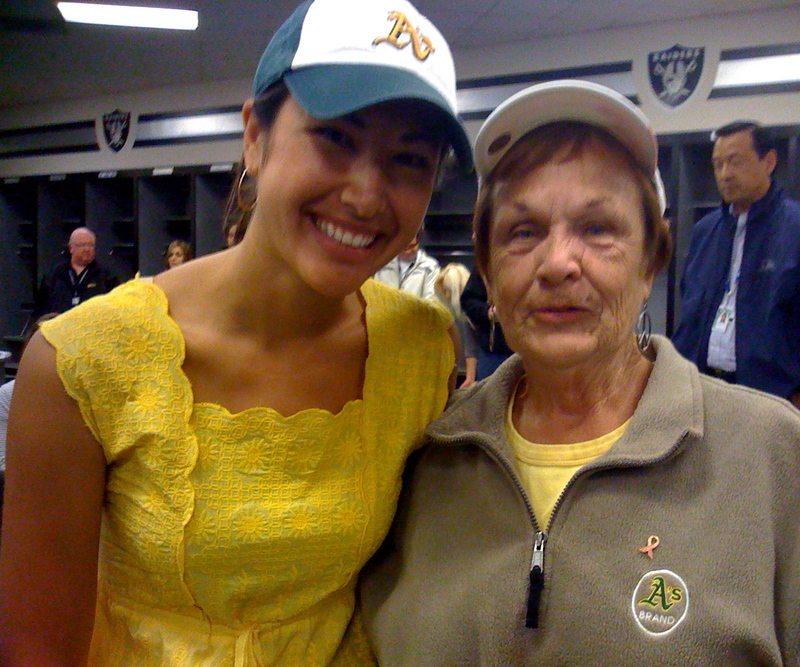 I had met her last season when I interviewed her during a game. She’s a delight: sweet, fun, sincere. And of course, she’s given one of the best quotes of the year: “Stick it A-Rod.” Love it. 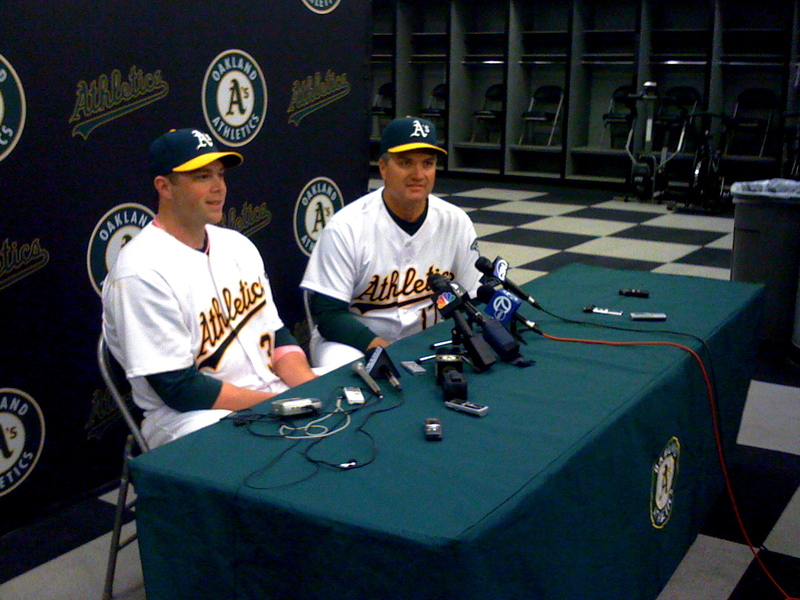 Right, catcher Landon Powell and manager Bob Geren replay the Perfect Game to media. 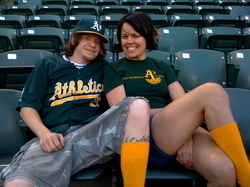 Above, the awesome fans from the left field bleachers aren’t new to the talents of Dallas Braden. They’ve been hanging their “Braden-Stockton-209” sign at every game he’s started this season. We love your enthusiasm and we love your dedication! 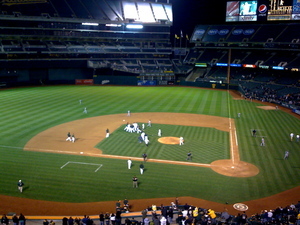 Above, I watched the end of the Perfect Game from Diamond Level and captured this shot while the team was celebrating the win. For a fan, it’s always special to see the love between teammates. It gets me all choked up again just thinking about it!! 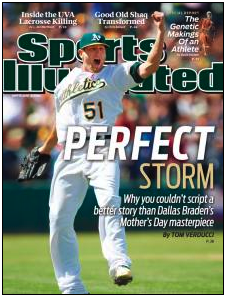 Today, May 9, 2010, Dallas Braden secured his name in history books. He stands as the 19th pitcher in the history of Major League Baseball to throw a Perfect Game. 27 up, 27 down. In a word: Incredible. Since hardly anyone receives the newspaper anymore, there are no great front pages to clip out and save. Instead, here are some screen shots that document and record the online media frenzy surrounding Dallas’s once-in-a-lifetime performance. and off the field. Of course, we can’t overlook the error-less fielding from the other 8 members of the team. From Landon Powell’s catching to Kevin Kouzmanoff’s killer plays at 3rd, every single member of the team brought their A games to the ballpark today. Even though we’re only five weeks into the 2010 season, Dallas has certainly had his ups and downs. As you may remember, the ups include a 3-0 record to start, 10 strikeouts in his first outing and a tongue-lashing to that cocky Alex Rodriguez. The downs are the ensuing bad press after the aforementioned tongue-lashing and a nasty whooping from the Rays earlier in May. The amazing thing about throwing a Perfect Game is that all of those previous outings will be remembered in a new light, like B.P.G. (Before Perfect Game) and everything after will be seen in a new context, A.P.G. (After Perfect Game). that he’s wearing the green and gold. these days. All I’m going to say is we need you, the fans, to show up! the team is in first place in the AL West?! the week from an attendance standpoint: Monday, Tuesday and Wednesday. 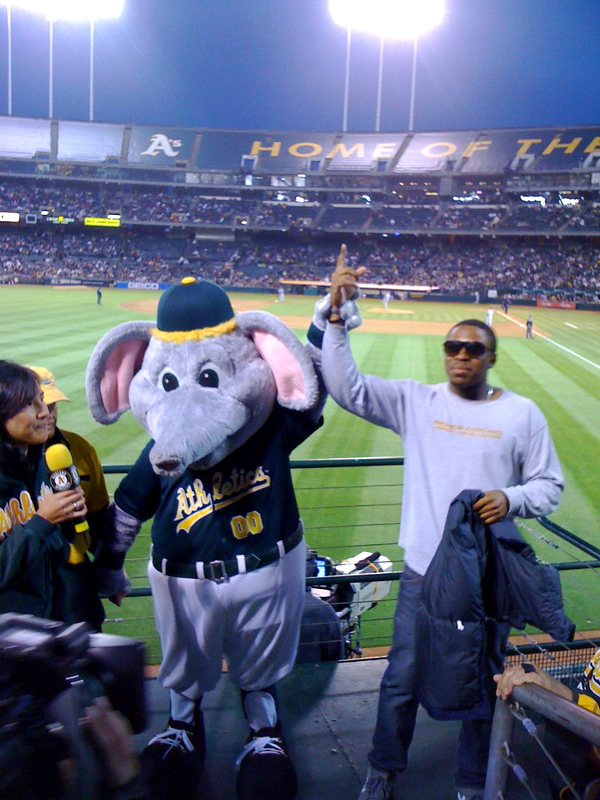 Tune” and won, so get ready to see the duo back at a future A’s game. the right, because of her D-I-Y, A’s style. 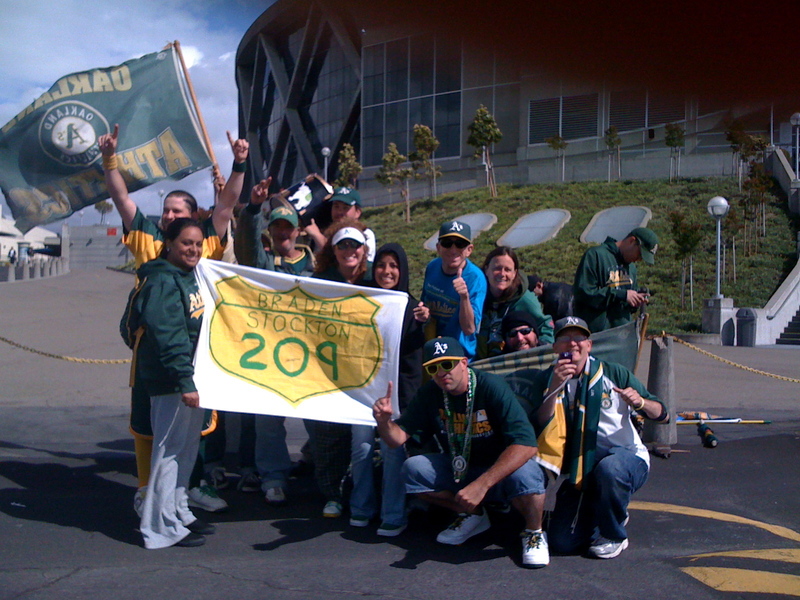 Love the scarf and customized A’s t-shirt. 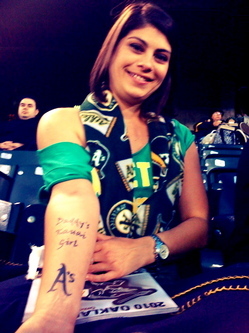 Even better, she was sporting a pretty serious A’s tattoo in honor of her late father, a diehard A’s fan and the one who introduced her to baseball. These three cuties win the award for most adorable fans. 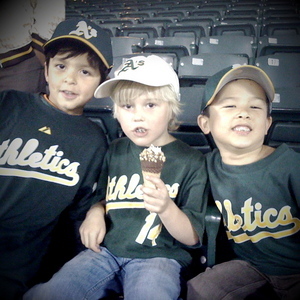 Aaron, Charlie and Kai were fun to spend an inning with; I hope their fathers forgive me for giving them sugar in the form of Drumstick ice-cream cones at 9pm!